Enclosed cabinets or cupboards are ideal for storing paper goods, dry goods, and other non-perishables. Make sure cabinet doors are secured while driving. Built-in prep counters are ideal and are sure that they are made of a food-safe surface such as stainless steel (no wooden counters, please). Just as you would in a restaurant kitchen, keep all cleaning products and other hazardous materials away from food and serving utensils. Any coolers, refrigerators, or freezers should be bolted in place for safety. They should also have proper ventilation and electrical outlets. The same is true for commercial ovens, grills, and deep fat fryers. Additionally, grills and stove tops may need a hood with a fan and sprinkler system, all properly vented to the outdoors. Your food truck will need at least one large window for serving customers. An outside counter can hold napkins, condiments, and plastic flatware. An awning over the window is a good investment for both rain and hot weather. In order to obtain a food truck license or permit, your truck will need to pass a fire and safety inspection. The inspection particulars will depend on the ordinances in your area. However, basics include fire extinguishers, a sprinkler system, and fire alarms as well as food safe surfaces on walls and floors. 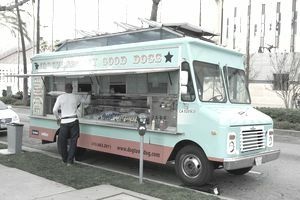 Be sure to check with your local licensing agency before finalizing your food truck design. Some food truck owners opt to rent a commercial kitchen space. This provides them ample space to store and prepare food. If you are thinking of using your home kitchen to prepare items for your food truck, it must be inspected and improved by your local health office - which varies from state to state. Simply put - you can't prepare food in your home (legally) and then sell it out of your food truck. Do Restaurants Need to be Certified to Serve Organic Food?